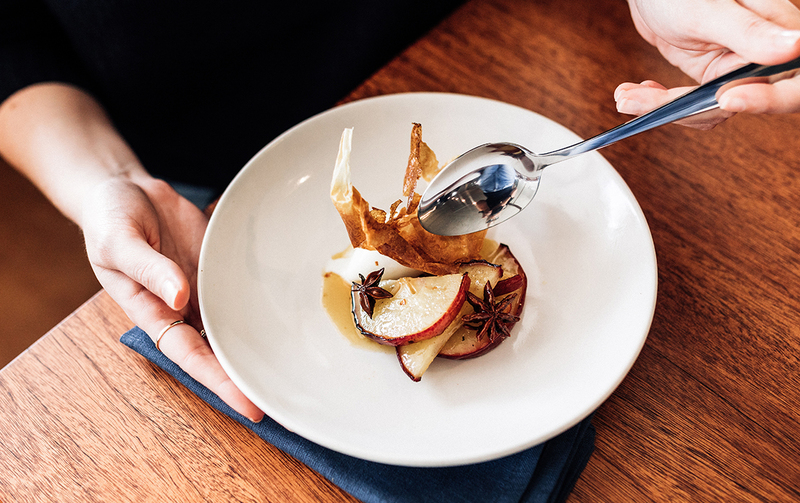 When we broke the news back in May that uber-talented Sydney chef Alex Munoz Labart and his Gold Coast-raised wife Karla were set to open a fine dining restaurant in the foodie hub of Burleigh Heads, we were stoked to say the least. And now we’ve had a sneak peek inside Restaurant Labart, before it officially opens on July 18. We’re crushing hard—this place is seriously impressive! The food, which is modern Australian, is of course the star here, but more on that later because the carefully thought out interior deserves its own round of applause. The space, formerly a Chinese restaurant, has been lovingly restored into a chic, luxe eatery. The 60-seat restaurant features an open plan kitchen—with a lust-worthy marble chef’s pass—and charcoal grill allowing diners a front-row seat to watch Alex and his talented team work their magic. And while this place is fine dining at its best, don’t expect white table clothes or stuffy interiors. Restaurant Labart is bringing a touch of European sophistication to the GC dining scene, with its urban yet warm fit out, polished concrete floors, walnut timber tables and navy linen napkins. 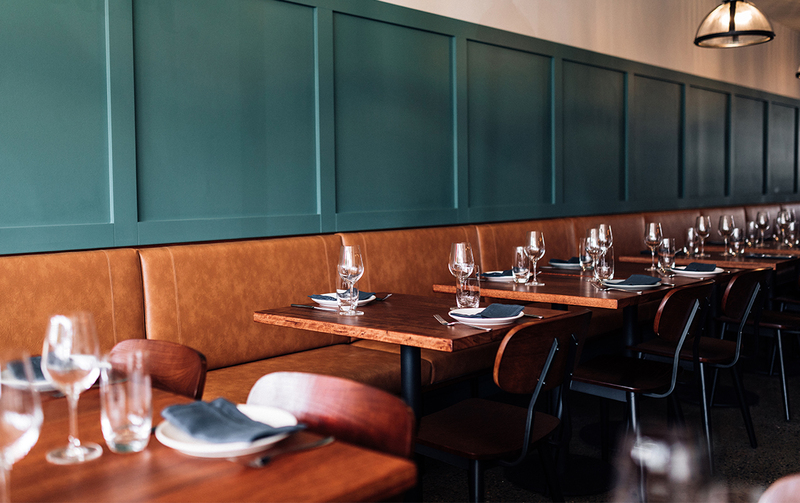 Dishes are served on bespoke Marloe Marloe tableware and the walls are the perfect shade of moss green, which perfectly complements the soft tan leather banquette than runs the length of the restaurant. AKA it’s the ideal place to bring bae, impress out-of-towners, or let’s be honest just treat you and your pals. Ok, now what you’ve all been waiting for…the food! Alex is one seriously talented bloke. He was head chef at top Sydney restaurants Cirrus Dining and Monopole, both of which were awarded two Chef’s Hats under his leadership. So naturally we were expecting big things from him and yep, he delivered and then some. The menu is designed to be shared with snacks, small and large plates on offer, with all ingredients locally and sustainably sourced. Here the snacks are certainly no afterthought though, think charred carrots with hazelnut butter and manchego. And you can’t go past the mussel ceviche with avocado on toast—hello taste sensation! Moving on to smaller plates we recommend the local spanner crab with charred baby leeks and roasted crab sauce. Light and delicious, the flavours dance on the palate. Next up there’s veal tartare with sundried tomato, tarragon and potato crisp—this has to be just about the prettiest tartare we ever did see, and even better, it’s just as tasty as it looks. 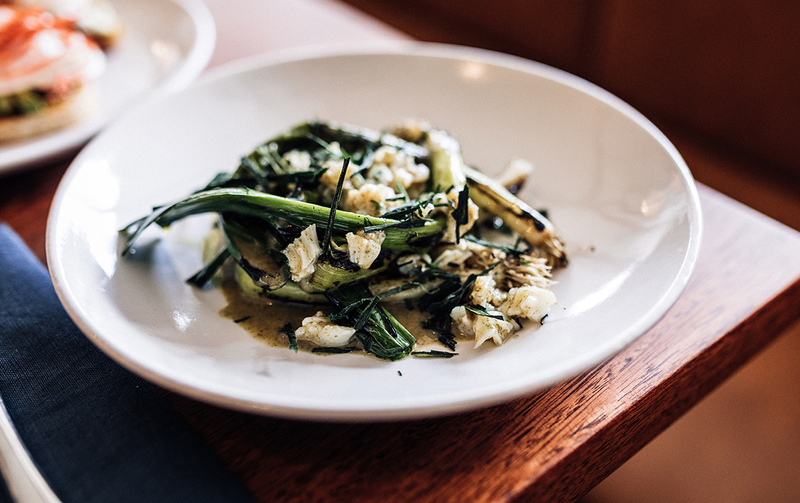 Large plates include a moreish grilled lamb rack, charred turnips and green herb sauce, as well as seared blue cod, peas, dill and horseradish. But before you get carried away—and FYI we highly encourage you do—please make sure you leave space for dessert. The chocolate mousse is oh so silky and comes with popcorn ice cream—yea you read that right—and it’s just as epic as you’d think. We won’t even blame you if you don’t want to share that one. Not much of a sweet tooth? The yoghurt sorbet with glazed pear, star anise and milk skin is tangy and refreshing. And because we know you guys love a tipple (or ten) you’ll be pleased as punch to know they’ve got you covered there too. 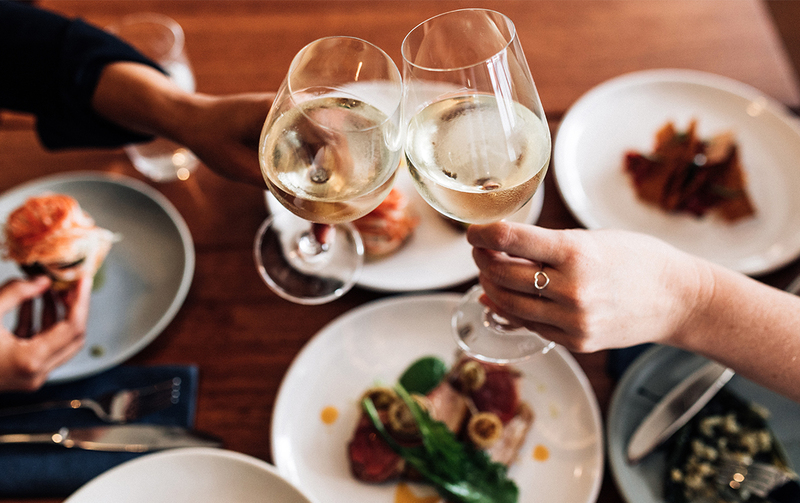 There’s a concise wine list featuring whites, reds, rose and bubbles sourced from Australia and overseas, as well as local brews like Black Hops, Balter and Green Beacon to satisfy the beer-lovers too. Consider yourself a cocktail connoisseur? You’ll love their selection of local liquors including Sydney’s Four Pillars gin and Melbourne’s Starward whiskey and Moonshine Apple Pie. We’ll take one of everything please. We’re almost positive we’ve got you hooked and so you should, Restaurant Labart is a game-changer. Stop by for a cocktail at the walnut timber bar or stay for a long lunch AND dinner—there’s no judgement here. We’ll see you there. Looking for somewhere to kick on later? Check out our list of the best bars in Burleigh.